• Gold In category “ Print Ad / Single- Regional ”. • MY FM bags a bronze for “Maango Haq Se” activity under the Health/Medical category.MY FM ran a campaign wherein they encouraged menstruating women of all sections to use sanitary napkins and not resort to unhygienic alternatives like a strip of cloth or other materials. The campaign aimed at addressing the taboo around periods and ignorance about using sanitary napkins in the less privileged strata of the society. MY FM created a tall “LaalDeewar” where people from across cities came forth to tie a red cloth and pledged to bring about the necessary change in their outlook and help women during their menstruation cycle. Dainik Bhaskar Digital won Global Media Awards organized by INMA for the Best Use of Data Analytics for Autobot, the Automated Intelligent Push Notification Engine on 5th June in New York. • Awarded a Silver at WANIFRA Asian Media awards. Coffee Table book on Ujjain has won two international awards at Indie excellence awards and International Book awards. • Bronze - Effectiveness - Jeeto 15 Crore, Creativity - Jeeto 15 Crore, Innovation - Book Readership Survey, Creativity - Trade Mailers Maharashtra, Media - Swatantra Vrittpatra, Successful Use of CSR Activity - Saarthak Deepawali Print Ad. 1 Talentrack Awards – (Silver) for Sarthak Deepawali for Best Digital Content-Development & CSR. DainikBhaksar.com also bagged three national awards at DIGGIXX for Autobot, Big Data tech and Ramleela gamification. Dainik Bhaskar Digital bestowed with the title of Most Digitally Enabled Organization, in the category of Technology Awards for AUTOBOT by 8th India Digital Awards organized by The Internet & Mobile Association of India (IAMAI) in New Delhi. The Dainik Bhaskar Group won the Platinum Award under the category 'Integrated/Mixed Media/Ad Campaign' at the Summit Marketing Effectiveness Award, 2016.
wins Gold at the Indian Marketing Awards, 2016 The Dainik Bhaskar Group won the Gold Award under the category ‘Marketing/Communications’ at the Indian Marketing Awards, 2016. Zidd Karo Duniya Badlo’ wins under the category ‘Media and Entertainment’ at the Indiaa Awards 2016. The Brain Hunt 2012 activity, received 80,000 qualifying entries. One of the activity included in Brain Hunt was to write a letter to the President of India, sharing ideas on 'How can we make India even a better country'. The India Book of Records acknowledged this record as the 'Most letters written to the President of a Country'. 1. 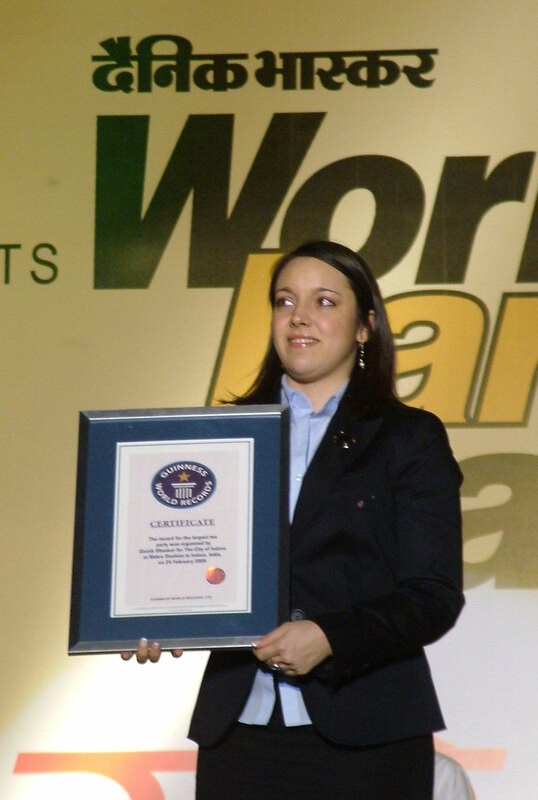 Junior Editor (The manual newspaper making activity) gets recognized by Guinness World Records. 2. This innovative initiative of Dainik Bhaskar group gets the record for being the largest hand written newspaper competition for children, with more than 67,130 entries. 1. 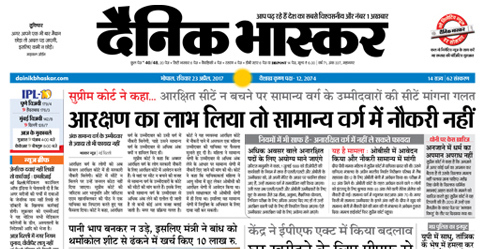 On Holi, the festival of colours 'Dainik Bhaskar Group' dailies Dainik Bhaskar, Divya Bhaskar and Saurashtra Samachar brought out. 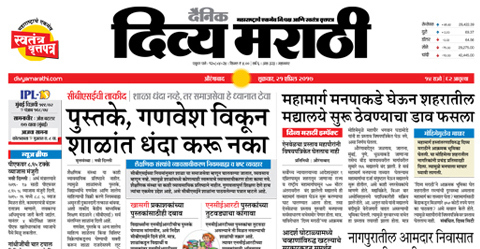 country's first perfumed newspaper. 2. 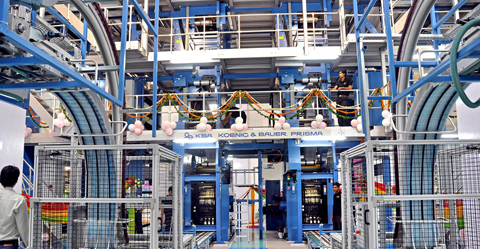 41,69,889 copies of the newspaper, scented with the fragrance of kewra (screw pine) flower were distributed. 3. 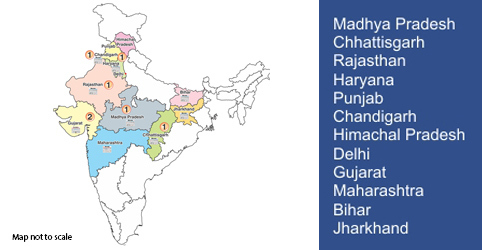 Rajasthan & Jharkhand: March 19th 2011. 4. Rest of states: March 20th 2011. 1. 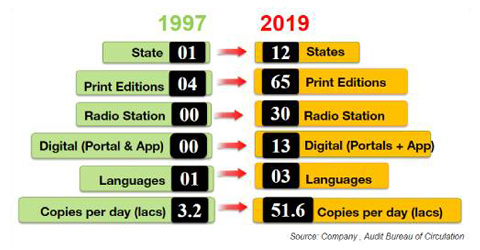 Dainik Bhaskar Group won awards for Brand excellence in print and radio category. 2. Brand leadership Award – Dainik Bhaskar. 3. Brand Leadership Award– 94.3 MY FM. 1. Divya Bhaskar won the silver award at the National Awards for Excellence in Printing. 2. This Award was organised by the All India Federation of Master Printers (AIFMP) and The Karnataka State Printers Association (KSPA). 1. 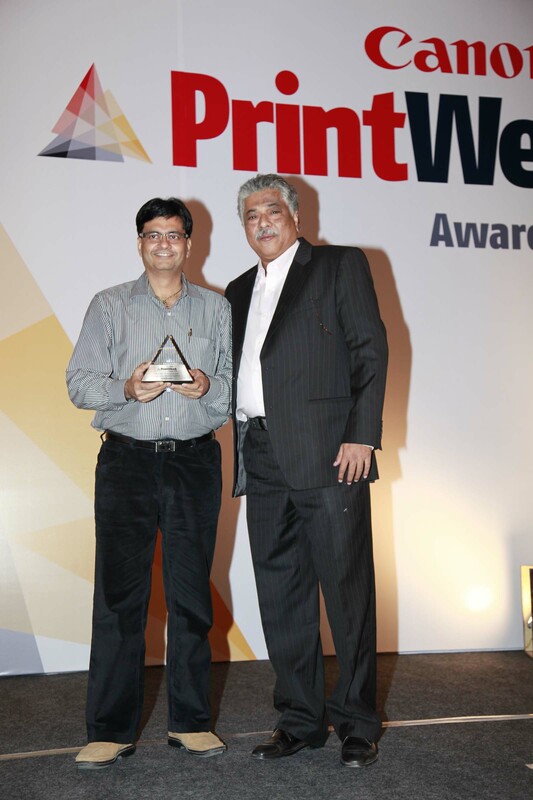 Divya Bhaskar won the Newspaper Printer of the Year award by Print Week. 2. 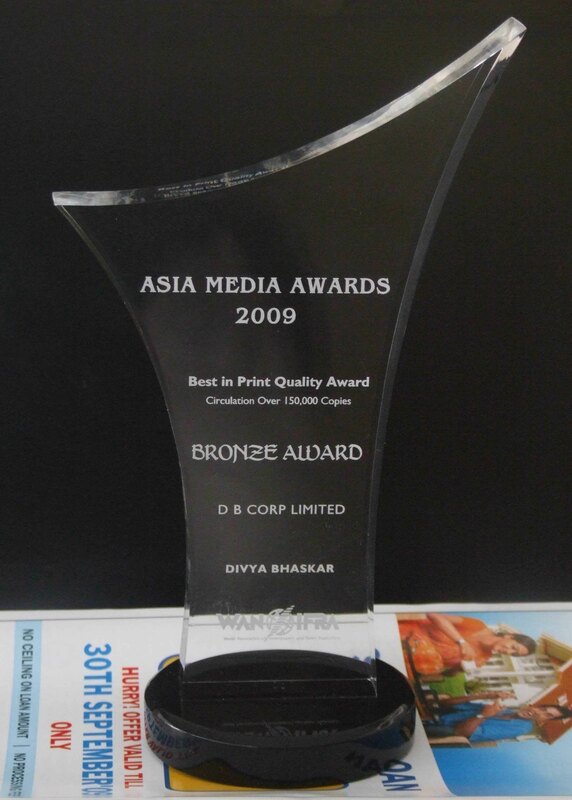 This is the 3rd time in a row that Divya Bhaskar has won the Print Week awards. It has won earlier in 2010 & 2009. 2. 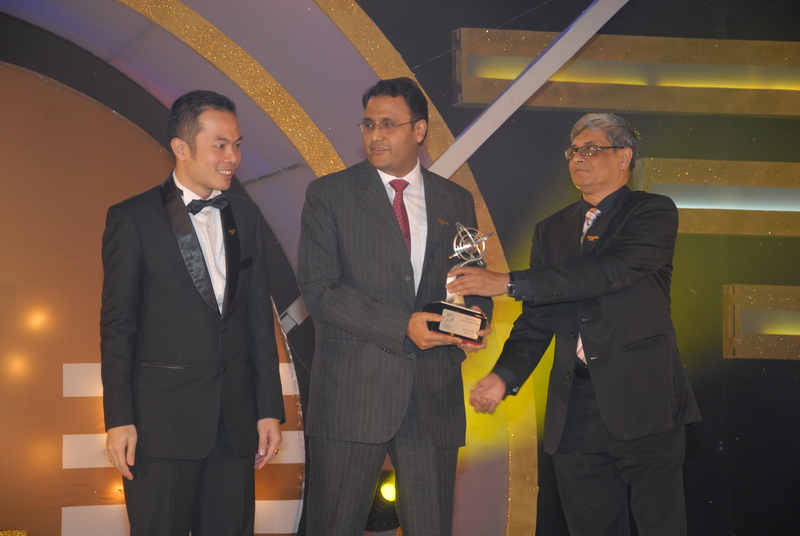 Best In House Magazine - SAMVAD (DB CORP LTD). with circulation above 150,000 copies. The event was held in Bangkok on 28th April, 2011. 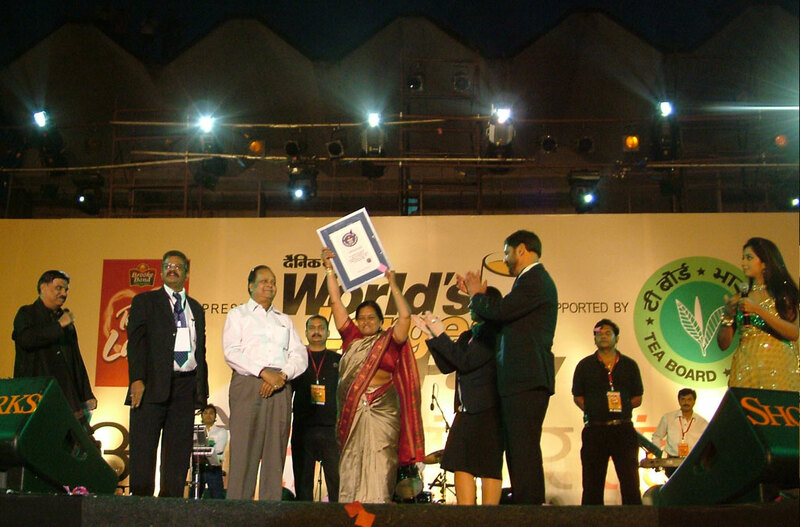 It gives us extreme pleasure and pride to announce thatDainik Bhaskarwas recipient of an award at the prestigiousINMA (International News Media Marketing Association) Awards, 2010held in New York on 28th April. 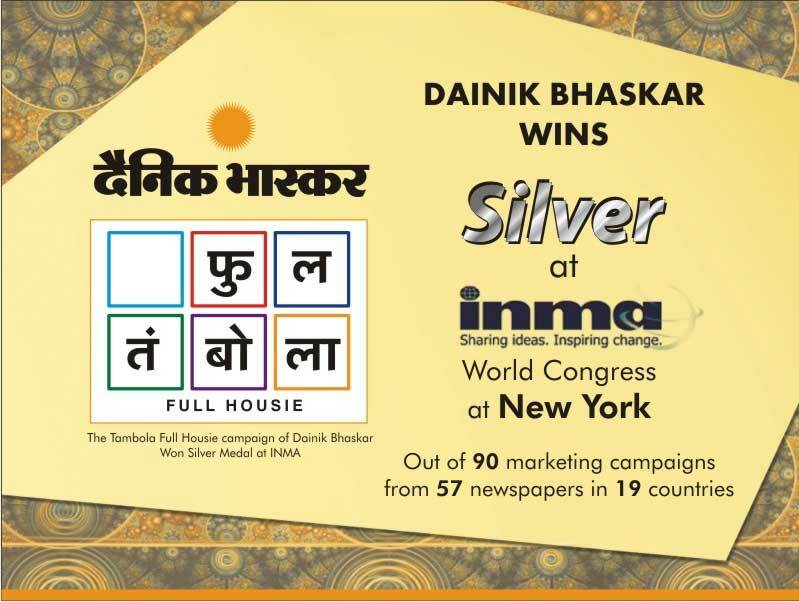 Dainik Bhaskar bagged the second position, and won a silver for'Tambola- Full Housie'a reader interactive activity in category'Marketing Solutions for Advertising Clients'. The awards were presented by Michael Phelps the association's president at the 80th Annual INMA World Congress at the Marriott Marquis Hotel in New York. The 75 year old INMA Awards generated 533 entries from 137 newspapers in 28 countries this year. 23 judges, including executives from media companies, product manufacturers and consulting firms from across the world, selected the winning entries in 10 categories in three circulation groups – under 75,000; 75,000–3,00,000; and more than 3,00,000. Spread over 3 monthsTAMBOLA FULL HOUSIEwas played in 19 cities across 11 states simultaneously. The readers won prizes worth more than Rs.2 crores. Our Radio Business MY FM 94.3 receives 2010 INTERNATIONAL BROADCASTING EXCELLENCE AWARD from National Association of Broadcasters, USA. National Association of Broadcasters, USA(NAB) ANNOUNCESIndia's MY FM 94.3 and Sri Lanka's Shree FM asRECIPIENTS OF 2010 INTERNATIONAL BROADCASTING EXCELLENCE AWARD. 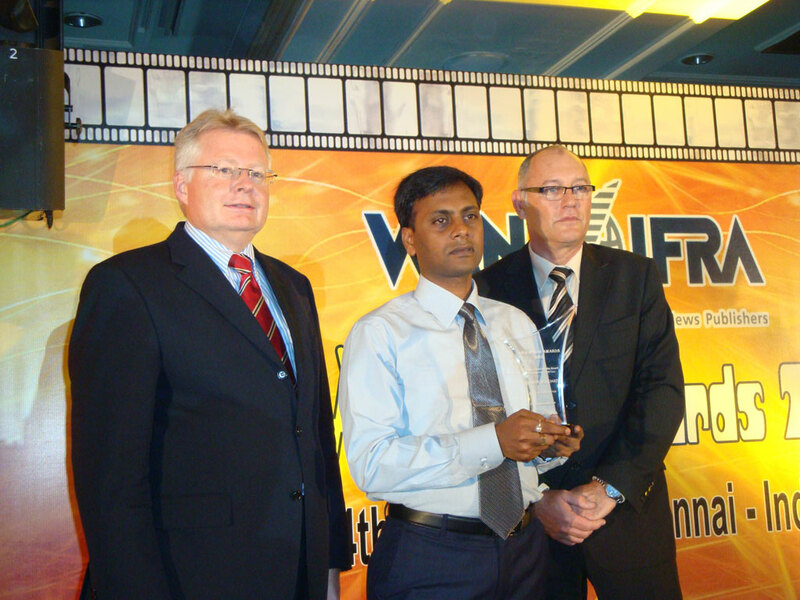 Sri Lanka's Shree FM and India's MY FM will receive the 2010 NAB International Broadcasting Excellence Award at this year's 2010 NAB Show, held April 10–15 in Las Vegas. The award recognizes international broadcasters that have demonstrated excellent leadership and originality in serving their audience through broadcast advancement or remarkable service to the community. 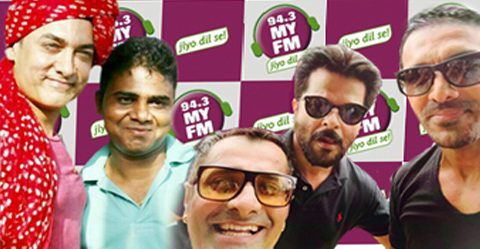 India's 94.3 MY FM tirelessly served their community, dedicating its airwaves to several philanthropic initiatives aimed at helping its listening area. With a broadcast network that spans 17 cities and seven states, MY FM successfully coordinated large–scale blood collection drives and clothing donation centers. A 10–day warm clothes drive alone provided clothes to more than 10,000 homes and spanned across three cities. The station also successfully initiated a voter education effort, launching a creative campaign to reach listeners with information on the importance of their vote. Ramesh Agarwal, chairman of the Bhaskar Group and one of the promoters of DNA, was on Monday presented with the prestigious Saraswati Puraskar. The award, instituted by the Nashik–based Kailas Mutt Trust, was presented to Agarwal for his contribution in the fields of media and social work. At the ceremony, Agarwal felicitated Swami Sanvidanand Saraswati of the Mutt. "We should not be running after Laxmi (money) alone. Saraswati (knowledge) is important too. Knowledge has the strength to wipe darkness. We have to abide by our culture through such knowledge. In the race for peace and prosperity, people follow money but if you follow knowledge, money will come subsequently," Agarwal said at the function. The Award was given for a Unique Direct mailer, in which all the "A" Blocks were removed from the scrabble game along with the "A" alphabets on the box design. The award was given for unique usage of Newspaper. A pre–paid inland was designed specially for newspaper, so that the readers could just fill it – cut it and drop in the regular post box without bothering for finding an envelope or sticking any stamp. 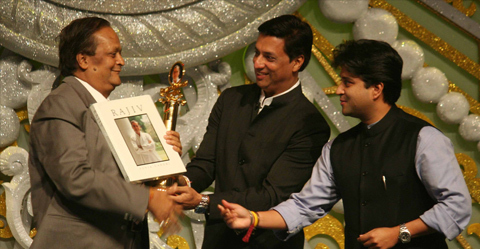 The Award was given for a Unique Print Innovation in Campaign India Magazine. All “A” letter was removed from the front page. Dainik Bhaskar had release a hard Hitting anti smoking print ad. The Award was given for a Unique Print Innovation in Campaign India Magazine. All "A" letter was removed from the front page. Dainik Bhaskar won Gold Awards at the Global Youth Marketing Forum for Best Creative TV. 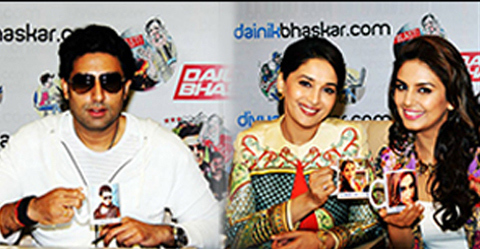 For its television advertising campaign 'Zidd Karo, Duniya Badlo'. The industry’s great and the good celebrated the best in Indian print on 25 October at the PrintWeek India Awards 2009. The Award for Newspaper Printer of the Year saw 10 entries. 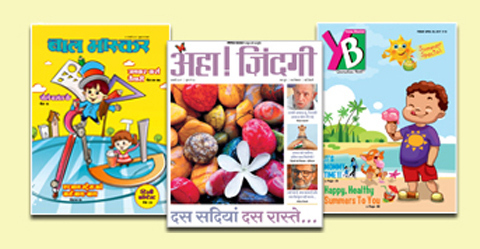 The judges found some well-executed publications that demonstrated excellence, but selected Divya Bhaskar over others for its outstanding colour and overall quality. The awards were judged by an impressive jury of 23 print customers and experts, put together by PrintWeek India on 31 July. Sh. Ramesh Chandra Agarwal Chairman DBCL received Rajiv Gandhi lifetime achievement award in the field of Journalism. The award was presented by Jyoti Raje Scindia Member of Parliament and Madhur Bhadarkar renowned Film Director at a function held at NCPA Mumbai. 'Number 1 from Day 1' is the title of the case study presenting the Dainik Bhaskar launch in Jaipur, in the book "Making Breakthrough Innovations Happen" by Porus Munshi, a partner consultant at Erehwon Innovating Consulting. The book identifies it as one of the two Orbit Shifting Innovation. In total there are 11 cases identified in the book, where people or organization have made “the impossible” happen by questioning existing norms , practices and category truths. The other case studies to feature in the book are Arvind Eye Hospital, Titan, ITC — IBD, Bosch India, Cavin Care, Santa Biotech, Su-Kam to name a few. 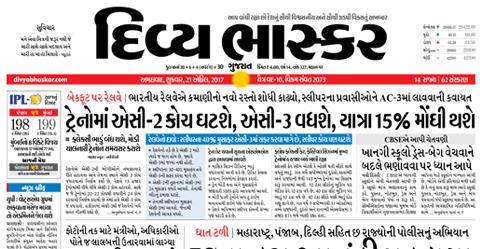 Divya Bhaskar , the leading Gujarati Newspaper from DB Corp Ltd was the only regional newspaper of India to win “Best in Print” (Bronze) , an honor bestowed by IFRA Asia Pacific awards held in Chennai. Best in Print is about the quality and consistency in printing demonstrated by a publication through a period of time. This is awarded to a newspaper after having passed and qualified a 4–stage test for quality and consistency evaluated by technical experts. 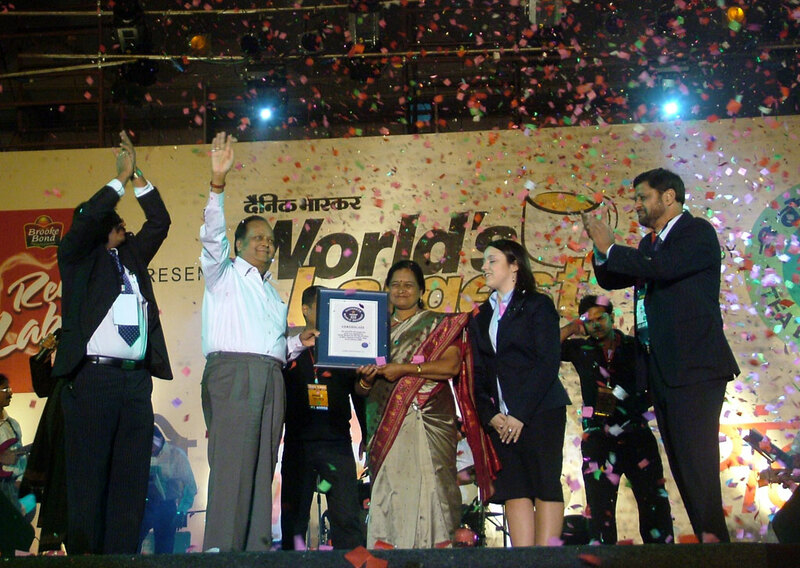 Dainik Bhaskar the Hindi Flagship newspaper of DBCL got voted the consumer Superbrand 2009-10. SUPERBRAND is a status awarded by Superbrand council based on the Brand success and consumer faith , trust. The council that adjudged Dainik Bhaskar as one of the consumer Superbrands was chaired by Anmol Dar — M.D., Superbrands India and has eminent personalities like Sam Balsara — Chairman & M.D. of Madison Communications Deepak Kapoor — M.D. 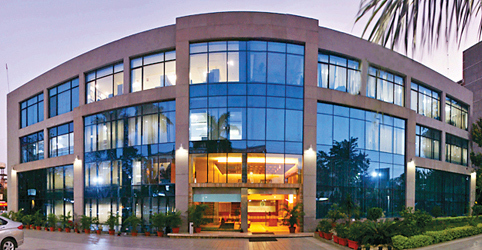 of Pricewaterhouse Coopers, Anand Kripalu — M.D. of Cadbury India, G Krishnan — Executive Director & CEO of TV Today, Naveen Kshatriya — CEO & M.D. of Castrol India, S K Roongta — Chairman of Steel Authority of India, Hemant Sachdev — Joint M.D. of Microsoft Corporation, R Seshasayee — M.D. of Ashok Leyland, Suhel Seth — CEO of Equus Advertising Company, Gautam Thapar — Chairman & CEO of Avantha Group. OUTSTANDING ENTREPRENUER is awarded to individuals who have demonstrated entrepreneurial attributes that make them role models for emerging entrepreneurs, including the tenacity and perseverance to continue innovating and making a difference under adverse situations and environments . These individuals continue to provide the vision and direction to their companies and are poised to be captains of their respective industries in future. 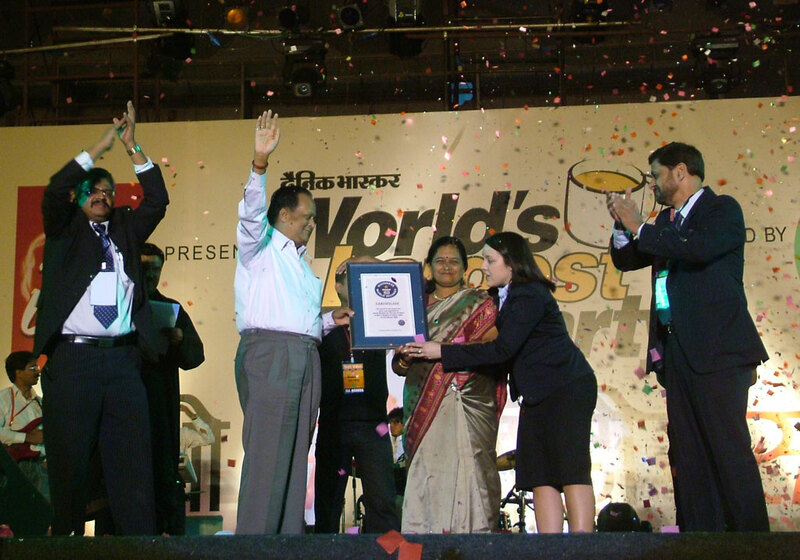 On 24th of February 2008 at Indore Nehru Stadium, 32681 participants simultaneously had Tea, creating the record for the WORLD’s LARGEST TEA PARTY . Brooke Bond Red Label was the official brew for the event and was supported by tea board of India. Before this the largest Tea Party Record was held by Nishiao City of Japan where serve just 14751 people had green tea. 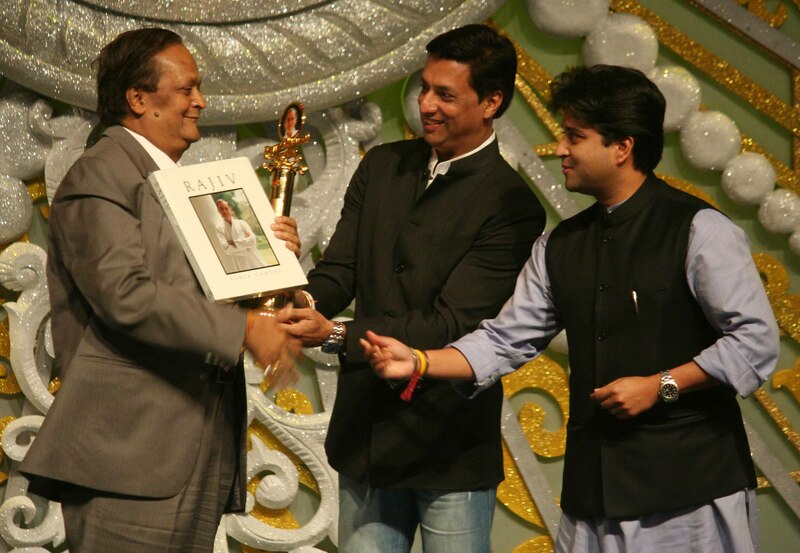 Marico Innovation India Award for Business Innovation was given to Divya Bhaskar in 2006. Instituted by the Innovation for India – A Marico Foundation, Erehnov Innovation Consulting and Business world initiative to foster the spirit of originality and creativity in the Indian industry. The award to Divya Bhaskar was given in the category of Product/Process Innovations. 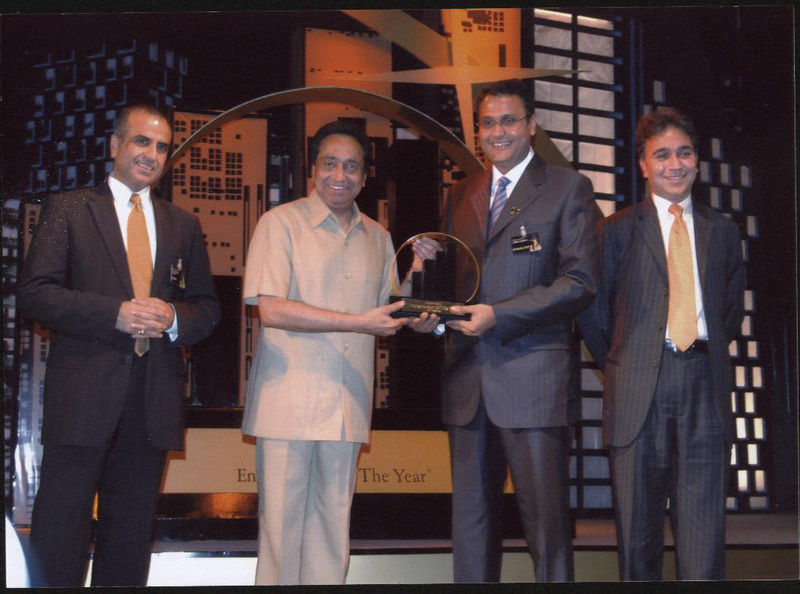 Mr. Girish Agarwaal the Director of Group Bhaskar was felicitated with the prestigious Ernst & Young Entrepreneur of the Year 2006, in the category IT, Communications & entertainment. The Entrepreneur of the Year Award is an acknowledgement to the entrepreneurial spirit that works dedicatedly to shape the future with innovation and brilliance. The Dainik Bhaskar Punjab launch, which was a culmination of in–depth consumer research, reader driven editorial and an all–encompassing circulation drive won the prestigious APMA Awards (Asian Publishing Management Awards) for the Gold for Best Launch in Punjab. The results were evident on the day of launch when circulations touched 1.76 Lac i.e. 0.176 Million (8th October 2006). Dainik Bhaskar was felicitated with this award to recognize its excellence in design, usefulness and clarity of information conveyed in newspaper and magazine.